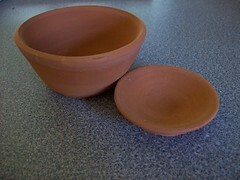 These are two tiny bowls I made out of the Mississippi River clay. I just took them out of yesterday's bisque firing. I have to say that I'm pretty shocked at how much they look like terra cotta. I've used terra cotta clay before; it looked the same before and after firing. My river mud was deep brown/black even when bone dry (here is a finished, but still unfired, mud bowl. There's obviously a lot of iron in that clay. Any other colorants have fired out, and it's possible that they'll fire out even more on the next, higher temperature. Later this week/weekend I'll glaze the pieces in this load*. I'm going to try a clear glaze, because for these pieces, the color of the clay is why they even exist. But, since I don't know if these will even stand up to cone 6 firing (2200 degree Fahrenheit range), I'm not risking my "good" piece yet. The experiment goes on. Slowly. *This load included a few berry bowls, but out of this batch of 11, 5 cracked. At least I know before glazing, but those aren't good odds, friends. I don't know which were cut with my new hole punch, though. I didn't do anything to distinguish them from the ones where I used my old one. I know that I STILL owe some of you bowls, and I'm sorry that it is taking me so long to finish them.